HMH Books for Young Readers, 9780544713581, 40pp. Bobo is a dog who likes his life just the way it is: at the center of his beloved parents' attention. 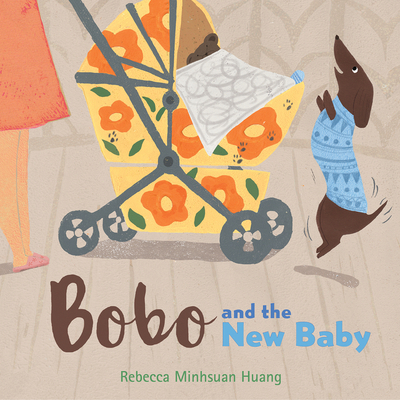 In this warmhearted new-sibling book, Bobo proves that dogs are not only man’s best friend, but baby’s best friend, too. Rebecca Minhsuan Huang is an illustrator from Taiwan currently living in San Francisco. She makes her debut with BOBO, which she was inspired to write after hearing about a couple who sent their dog away when their new baby arrived. “I felt sad when I heard that because I think dogs are a human’s best friend. They do no harm.” So she wrote this story, trying to use a different point of view, and giving her story a happy ending. www.rebeccamhuang.com.